Here is another hairband made from a hat pattern. The pattern I selected resembles the interlocking shell stitch pattern. This is also a pattern with a decrease by reducing the number of shells in the row. 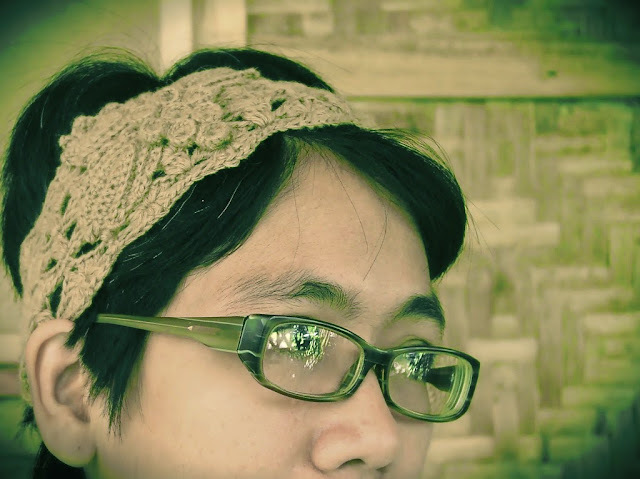 In the previous hairband project, I selected a shell decrease that reduced the number of stitches in each shell. Refer to the pattern below. 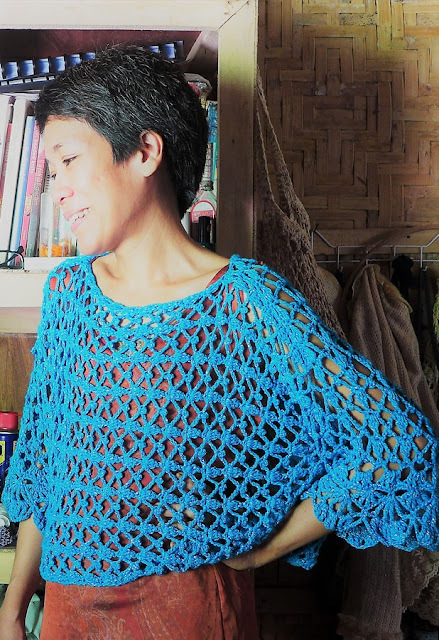 Methods of increasing and decreasing are important in crocheting. 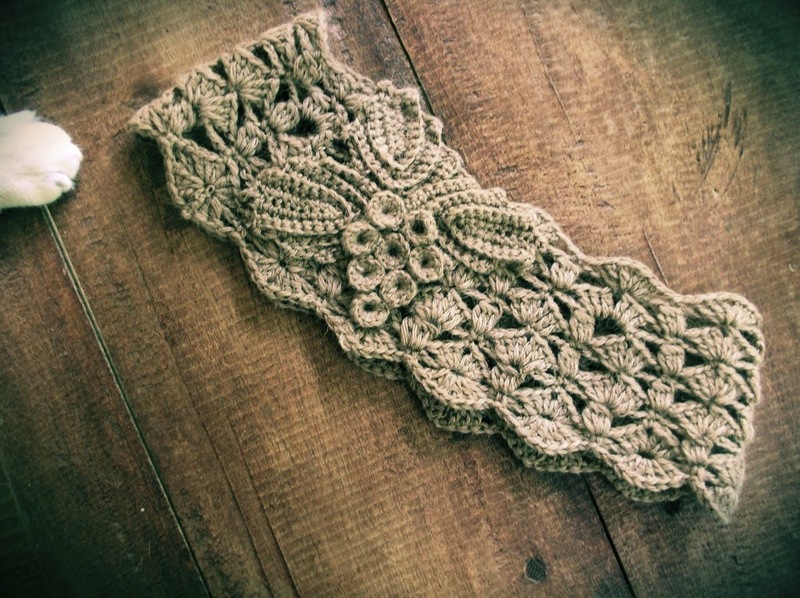 It certainly seems that one can crochet any shape with good methods of increasing and decreasing. For this project, I used DK weight baby camel yarn and I used a 3.5mm hook. Like this Hairband, this one tapers near the top. I like this shape because it hold very well around my head. This also means I don’t need an elastic or ties or other means to tighten the hairband and keep it in place. I decided to decorate the hairband this time. I used natural brown baby camel yarn for this and I thought that the light colour will make the crocheted decorations more visible but not too glaring. I made leaves and berries, sewed them together with silk camel thread and then sewed it onto the hairband with the same yarn that I used for the hairband. The pattern for the leaves and berries are described below. Begin with a Center Ring. Make 10 sc in circle, sl st on first sc to join. Ch 1, 10 sc over the first row of sc’s just made. Sl st in first sc to join. Fasten off. Row 1: Sc in 2nd ch fr hook (this would be the tip of the leaf) and in each ch across (11 sc made). Two more sc in last ch so that you turn to the other side of the foundation chain. Sc in each of next 8 ch. Ch 1, turn. Row 2: Back loop Sc in next 9 sc, 3 sc in next sc (this would be the middle sc at the base of the leaf). Sc in each of next 9 sc along other side of leaf. Ch 1, turn. Row 3: Back loop Sc in each of next 10 sc, 3 sc in next sc, back loop sc in each of next 8 sc. Ch 1, turn. Row 6: Rep row 2. Fasten off. And finally, the schematic for the interlocking shell stitch (shown above). The hairband I made measures approximately 3 inches wide with 10 pattern repeats plus one extra row of shells added separately along the rim. Here (written pattern below) is what I did to modify the hat pattern above. It is not much, but it does take a bit of modification to turn the pattern into a suitable pattern for the hairband. Don’t be afraid to modify patterns that you see so that you can adopt them to your design needs. Ch a multiple of 8 sts. Rnd 1: Ch 1, sc in 2nd ch fr hook, *ch 1, sk next 3 ch, in next ch make (3 dc, ch 1, 3 dc), ch 1, sk 3 ch, sc in next ch (shell made). Rep from * all around ending the last rep with sl st in first sc to join. Rnd 2: Ch 3, keeping last loop of each st on hook, make 3 dc in same sc, yo and pull through all loops on hook. Ch 3, sc in ch sp between first shell, *ch 3, keeping last loop of each st on hook, make 4 dc in next sc, yo and pull through all loops on hook (4-dc cluster made), ch 3, sc in next ch sp between next shell. Rep fr * all around ending the last rep with sl st in top of first ch-3 to join. Rnd 3: Ch 4 (count as 1 dc, ch 1), 3 dc in same sc, ch 1, sk 3-ch, sc in next sc, *ch 1, sk 3-ch, in top of next 4-dc cluster make (3 dc, ch 1, 3 dc), ch 1, sk 3-ch, sc in next sc (shell made). Rep fr * all around ending with sl st in top of first dc to join. Rnd 4: Ch 1, sc in ch-1 sp bet first shell, ch 3, *4-dc cluster in next sc, ch 3, sc in ch sp between next shell, ch 3, rep fr ending the last rep with sl st in first sc to join. Rnd 5: Ch 1, sc same st, *ch 1, sk next 3 ch, in top of next cluster make (3 dc, ch 1, 3 dc), ch 1, sk 3 ch, sc in next sc (shell made). Rep from * all around ending the last rep with sl st in first sc to join. Rnd 7: (Shell decrease row starts here) Ch 1, sc in same st, *ch 1, sk ch-3 sp and sc, in next ch-3 sp make (3 dc, ch 1, 3 dc), ch 1, sk cluster and next ch-3 sp, sc in next sc bet shell, ch 1, sk next ch-3 sp, in top of next cluster make (3 dc, ch 1, 3 dc), ch 1, sk next ch-3 sp, sc in next sc bet shell, ch 1, sk next ch- 3 sp and cluster, in next ch-3 sp make (3 dc, ch 1, 3 dc), ch 1, sk next ch-3 sp, sc in top of next cluster, ch 1, sk next ch-3 sp, in next sc bet shell make (3 dc, ch 1, 3 dc), ch 1, sk next ch-3 sp, sc in top of next cluster, rep fr * all around ending last shell with sl st in first sc to join. Rnd 9: Rep rnd 3. (Making shells). Fasten off. Now working along foundation chain of the hairband, join yarn with sc to a ch next to sc between the shells. Ch 1, sk 3 ch, in next ch where shell in first row is made, make (3 dc, ch 1, 3 dc), ch 1, sk next 3 ch, sc in next ch, ch 1, *sk 3 ch, in next ch make (3 dc, ch 1, 3 dc), ch 1, sk next 3 ch, sc in next ch, ch 1, rep fr * all around ending with sl st in first sc to join. Fasten off. When you make your hairband, keep the circumference short by maybe about 0.5 inch. 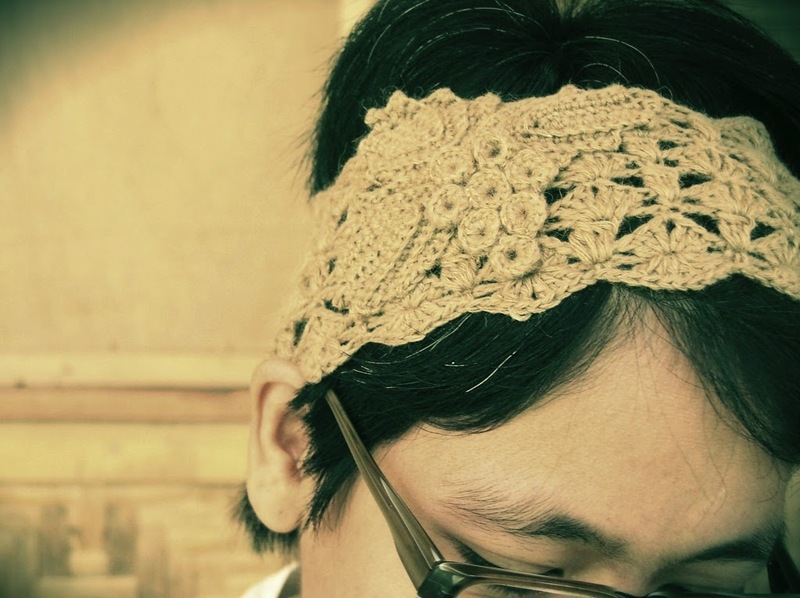 Yarn stretches so if you crochet exactly the circumference of your head, you may end up with a loose hairband. Take note also of how narrow the hairband tapers. If it is too short and narrow, it won’t fit at all up to your forehead because you have nearly closed off the top opening. Remember the pattern is really for a hat and we’re just using the pattern to make a nice fitting hairband! It's a beautiful headband! Irish crochet is my favourite, and I love how you brought in elements of that. Thanks for sharing the pattern! DK is 8 ply or 11 wraps per inch. You can feel free to use the yarn you are most comfortable with. I hope this helps!